352 Klutz Kwiz questions for really smart 9 and 10 year olds. 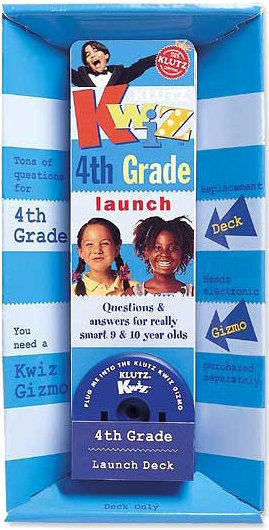 You need a Klutz Kwiz Gizmo to unlock the answers on this 4th Grade Launch Deck. Size (inches): 10.04" X 5.12" X 1.18"
Klutz Kwiz is an electronic answer pad that snaps together with interchangeable Decks of grade-specific questions. Pick a Deck, choose a question, and enter one of the four multiple choice answers. If you're right, you get a green light and a happy boop. If you're wrong, a red light and a sad boop.